Revamped Fashion offer custom designed garments and workshops for fashion forward people who like to stand out in the crowd. Either buy from the 'RevampedFashionLove' Etsy store or check out the 'Revamped DIY' and learn how to transform your old clothing into new unique pieces you’ll love and want to wear forever! Break out of the disposable fashion cycle and create your own trends, while saving money and being mindful of our beautiful planet. Revamped Fashion creator, Angie White is an award winning costume designer who has worked on reality TV shows such as 'Dancing With the Stars', 'The Voice' and 'Australia's Got Talent', and designed and created outfits for pop stars Mel B, Jessica Mauboy, Havanna Brown and Samantha Jade. 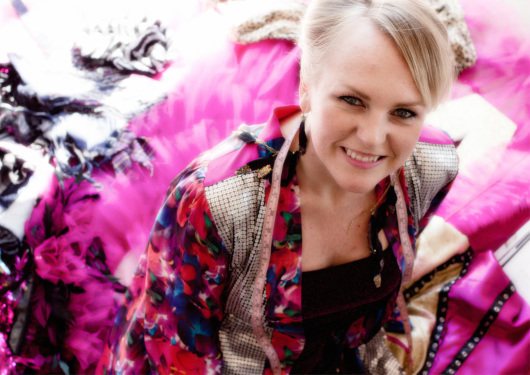 Angie has a Bachelor of Education degree, a Diploma in Textiles, Clothing and Footwear, and has been working in both the fashion and costume industry since 2006. Angie creates an environment where participants can share ideas, be inspired and let their imaginations run wild. Workshops are tailored to suit each individuals needs and learning desires and abilities. Angie has over ten years of teaching experience and is dedicated to empowering her students, leaving them with the skills and confidence to design their ‘look’, and create whatever imagine. "I was so impressed with your calm, creative direction over the whole day. The girls loved it." "The kids were absolutely buzzing today and happily sang your praises to the other students." Contact us to make a booking or sign up for a course in your area today.